Blue Hair Dye There are 62 products. Kawaii pastel, the movie ‘Frozen’ and the cool wintery look are ever popular, which is why we can’t get enough of light blue hair dye and think you will love it too. Your favorite stylist (or you) will be able to take our pastel blue hair dye and transform your hair into a marvellous unicorn or mermaid look, anytime you want. With so many hair coloring options at Dye My Hair, you’ll be changing your look every few weeks! So take a peek at some of our hottest selections and let us know which ones you love. These are just a few of our trendy shades that will transform you into an ice queen or king. You can also use them to achieve some of the hottest looks such as our customer favorite, black hair with blue tips. If black hair isn’t your thing, Sky Blue Hair Dye also looks exceptional on blondes with attitude. Crazy blue hairstyles are ideal for everyday wear, photoshoots, Halloween parties (think Sailor Moon, trolls, Smurfs, etc. ), cosplay events (Dragon Ball Z characters, Evie from the descendants, etc.) and any other occasion you could possibly think of. Ombre styles also work well with Light Blue Color Hair Dye. You could search our expansive selection of blues and utilize something like pastel blue hair dye on the top of the hair and a darker blue on the bottom to create the ultimate ombre designs! Mix and match your favorite hues of blue and you’re sure to be a show stopper. Any of these fabulous blue dyed looks can be achieved with one or multiple of our top-quality brand dyes that are sure to impress any stylist. Here at Dye My Hair we carry reputable brands like Crazy Color, Splat, Stargazer, Paintglow, Manic Panic, La Riche Directions and Herman’s Amazing. Not only do we carry top brands, but we ensure competitive pricing too. Why? Because we want you to have the best hair-do for less. So go ahead, pick your favorite and get your hair dye blue today. You are not going to regret it and if you decide to change your color we have plenty more shades for you to choose from when you return to Dye My Hair. Hair care accessories are useful to have on hand. For example, utilizing latex gloves will protect your hands and well-manicured nails from the staining of a quality hair dye. You might also consider using a dye bowl to mix your favorite Sky Blue Crazy Color. The dye bowl will allow you to remove the lumps and clumps from the dye as you mix it, which is a must if you want to achieve the perfect smooth and even color. A mixing bowl dedicated to hair dye also keeps you from ruining your favorite kitchenware. Our next favorite accessory is a hair dye brush. A dye brush of this professional quality will allow you to apply your dye exactly how and where you want it. Whether you want thin highlights, thick colorful strands or an entire head of Bright Blue Hair Dye, you can do it with a professional brush. No more struggling to apply it with your gloved hands. With a tinting brush you can apply it with care and achieve color, right to the roots. Before dyeing your hair, you will also want to check how the dye will attach to your current color. If you have a super dark color and are trying to achieve a lighter look, you might consider purchasing one of our bleach and toner kits to use as needed. If you need help deciding on this, consult with a professional or read our handy guides. After you have all of your favorite must-have accessories on hand, let the dyeing process begin. Icy blue hair is just like any other dye, it needs to be properly maintained. For advice, you could ask your favorite hair care professional about what products they recommend or check out our guides and blogs for more information. We think color preserving shampoo, conditioners and serums are the best way to keep your hair color looking fresh and bright. These products offer the perfect recipe for holding hair dye by removing harsh chemicals that may strip the color. There are other tips and tricks to preventing fading. We usually suggest that you wait 2-3 days after dyeing your hair to wash it. The reason behind this recommendation is this waiting period allows your dye to set in while minimizing color bleeding. Other important tips include avoiding using heated gadgets such as blow dryers, curling irons, and straighteners. Heat often harms hair, simply allow it to dry on its own and your lovely locks will be healthy as can be. Lastly, always purchase hair dye of any color from a well-known source, like Dye My Hair. It is imperative that you do because these sources always provide a range of PPD free hair dyes, natural dyes and every shade that you could possibly imagine. We pride ourselves on offering top notch hair products and accessories to you, so join in the craze and get light blue hair dye. If you’re looking for a hair color with some real wow factor to it, you should definitely check out turquoise hair dye! With Dye My Hair stocking an extensive range of semi-permanent turquoise hair colors, you’re certain to find a shade that suits you! If you’ve stuck with your natural hair color all your life getting a new color can seem like a pretty big change. However, there are plenty of pluses for changing your hairstyle. Turquoise hair color can completely transform your look and is sure to look unique thanks to its blend of blue and green.Whether you’re after teal or bright blue, the look of a punk princess or a mystical mermaid, we’re certain to be able to help. Turquoise is the way to go if you’re bored of natural colors! Turquoise is a color that simply speaks charm and fun. It is a popular choice for those seeking the mermaid hair look because it looks just like the color of the sea. How cool is that? If you want your hair to look as bright and flowing as the ocean, then turquoise is a superb hair color to choose. This gorgeous color evokes images of mystical creatures and fantasy lands. Loads of celebrities are similarly mad for turquoise. The amount of big names that have turquoise hair dye permanent is proof that this color is a must. Katy Perry, Lady Gaga, Jade Thirwall, Kesha, Demi Lovato and Joey King have all been snapped sporting turquoise hair dye. There’s just something about turquoise that you can’t get with any other color; it has a shimmering quality that can’t be matched! The increase in popularity of turquoise as a hair color over the past few years just proves that more people are enjoying this fabulous shade. Get yourself a green-y blue look now and get ready to impress your friends with your best turquoise hair dye. They’ll all be dyeing to get a look as good as yours! If you’re ready to take the plunge in getting a head of turquoise hair, then you should definitely read our top tips below, especially if you are looking for turquoise hair dye for dark hair. The more prepared you are when it comes to dyeing your hair, the better the outcome is sure to be! Always bleach your hair first – especially if your natural hair color is darker! We can’t stress the importance of this enough. If you apply dye to natural hair color without bleaching then the turquoise will mix with your natural hair pigments and won’t come through as vibrantly. Though our hair dye products last for a long time – some up to eight weeks – it’s important to remember that they’re temporary. However, there are a number of ways you can extend the life of your turquoise hair. Avoid applying too much heat to your hair, try and wash your hair less frequently and with colder water, be aware that sunlight may fade your color faster. Before diving headfirst into dyeing your hair, it’s always worth doing a patch test first. It will help you to make sure that you’ve picked the right hair color for you. There’s nothing worse than dyeing your hair and realising the color you choose wasn’t really the one you wanted. Take a look at some of the different styles you can achieve with hair dye before you go for full dye! As awesome as a full head of turquoise hair is, we definitely recommend checking out some other styles such as ombre and turquoise hair dip dye. With an ombre effect, you can include several different tones meaning the results may appear fuller and more vibrant. If you want to keep a hint of your natural color then a dip dye effect is sure to be perfect for you. We also stock a number of awesome brands, ensuring that your turquoise hair color is of the highest quality. Crazy Color, La Riche Directions, Stargazer, Splat, Paintglow and Manic Panic turquoise shades are all bright and vibrant. Choose the brand that is best suited to your hair and enjoy browsing Dye My Hair. So what are you waiting for? Dive head first into our fantastic selection of turquoise hair dye and get a gorgeous head of mermaid hair! If you need a little extra inspiration you can always check out our social media channels or blog posts. We regularly post style inspiration, brand information and awesome pictures to help make your decision easier! Want to try a new stand out hair ‘do? Forget your natural brown, black or blonde hair and dare to try a bolder, brighter color! For a completely new look, you need a transformative color such as teal hair dye. Many people are starting to realize how gorgeous dark teal hair dye can be especially when it is used on long hair. 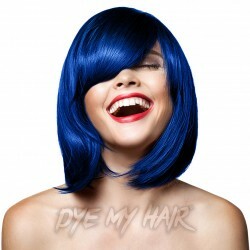 March to the beat of your own drum with an awesome new hair color and embrace this fabulous hue of blue. Why choose green or blue hair dye when you can have the best of both? If you are looking for that glossy and shiny finish, you need an outstanding new color. Teal blue hair dye comes in shades of all varieties, from aquamarine to bright green. You can choose dark, light or any other kind of shade to make yourself look awesome. Getting a new or temporary hair color can feel daunting especially if you have stuck with your natural hair color all your life but with home hair dye kits it couldn’t be easier! You may be surprised by how much confidence a new hairstyle can give you. With teal hair color, you can be sure that you will turn plenty of heads. Teal is an unusual color that consists of a blend of blue and green. It strikes a balance between the aqua beauty of blue and the natural feel of green. Our teal hair dye for dark hair and other hair types are temporary hair color dyes. They can last up to 8 weeks if you take steps to preserve your color. The best way to protect your dyed hair is by using a dry shampoo, showering in cooler water, using color protect shampoo and condition. Plenty of celebrities have joined the craze for this awesome color. We have seen Rihanna sporting long curly teal hair, Lady Gaga presenting a cute 50s style ‘do, Hilary Duff adding teal to her long locks and queen of the hair dye, Katy Perry switching to a blue/green hue. Hate the hassle of maintaining a dyed ‘do? Lucky for you this style looks awesome with dark roots peeking through. Maybe you would like to try a dip dye? This can look awesome with both light and dark colored hair. A blend of blonde and teal will give you a more washed-out summer beach style whereas a dark brown or black color mixed with this hue will give a punky vibe. Achieving teal hair color will require lightening and toning of your natural hair for best results. If you want to achieve the best color, we can help you by offering you the best hair treatment irrespective of your natural hair color. Some of the tips below will help you get started so you can get the best in teal hair color dye. One of the first things you will need to do before dyeing your hair with teal is to bleach it. Bleaching will help you to reduce or prevent your natural color showing through the dye. 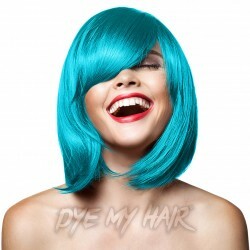 Dyeing hair without bleaching will result in a mix of your natural hair color and teal color, therefore producing a color different from the expectation. Next, you are likely to need toner to neutralise any unwanted tones in your hair. Using toner after bleaching your hair will take out the brassy tones left behind by this process. It essentially provides you with a blank canvas to apply your dye on to. The more neutral the starting color, the better the hair dye will show through. The next step is choosing the best brand and shade of color for you. With the gorgeous teal hair dye Manic Panic, you can achieve a glowing finish. The Manic Panic amplified range is especially popular in this shade because of its bright finish. As with several other teal green hair dye options in our catalogue, you can transform from your everyday locks to a new refreshed style with the snap of a finger. You can also select from La Riche Directions, Splat, Stargazer and Herman’s. Each dye features different qualities from being vegan friendly to ammonia free so make sure to browse the whole range before you choose your product. Before proceeding with dyeing your hair, it is usually advisable to perform a patch test to determine if a teal dye is the best for you. Making a mistake in your choice of color can leave you with the wrong shade of hair dye. Performing a simple test strip could be a time saver and also help you to achieve your desired look with ease. It is also important to test you are not allergic to the hair dye as every brand contains different ingredients. After applying the hair dyes, you may want to add other tones to your new look. Add a navy blue to the roots of your hair for a two tone or ombre effect. You could even try blue black hair dye for those of you who want to keep your dark natural color. Some of the most popular teal dye colors we stock include mermaid, siren’s song, UV turquoise and Thelma turquoise. We hand-pick some of the best teal brands in order to offer you the highest level of quality. We have a huge catalogue of dyes; this makes us one of the best one stop shops for hair dye so make sure to stock up on teal hair dye for your new style! If you’re looking for an on trend, yet truly alternative hair color that works with any style, it’s time to reach for the dark blue hair dye. 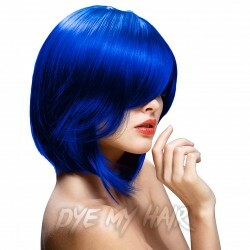 Unnatural hair color has been growing in popularity in recent years, with blue widely considered to be the most daring of dyes. This year has seen blue hair hit mainstream style in a big way, proving that this bold color can work for everyone and need not just be reserved for the edgiest among us. Summer of this year saw an explosion in popularity for bright blue hair colors such as aqua, turquoise and green-blue mermaid shades. While shocking blue hair is still a thing of beauty, this season’s must have shade has taken a darker turn. If you want to update your bright blue tresses or are thinking of taking the blue hair plunge for the very first time, choosing a dark shade of denim or navy blue hair dye is definitely the right call. Since Katy Perry first rocked the red carpet with her vibrant blue ‘do at the MTV music awards, more and more celebrities have been catching the blue hair bug. This season’s trendsetters include Kylie Jenner, who proved that bold midnight blue hair color can be a sophisticated statement, and Nicole Richie with her mesmerizing cobalt blue tint. Dark blue has been declared the undisputed champion of winter hair colors, with muted navy and gray tones surpassing the more fluorescent shades of blue, green and pink which ruled festival season this year. Think you don’t have the skin tone or natural hair color to pull off blue hair? Think again! This color is surprisingly versatile and can be made to work with just about any style or skin tone, whether you’re going for a subtle tint, thick strips of color or an all over blue look. Whatever you’re aiming for, we can help you to find the best blue hair dye to achieve that perfect finish! As with any unnatural hair color, you should choose your shade carefully to make sure it will complement your natural skin tone rather than making you look washed out. Don’t worry, this is surprisingly straightforward! People with cool skin tones should choose a shade of blue dye that has pink or purple undertones, such as midnight or royal blue hair dye. Whereas, those with warmer skin tones should choose dark blue hair dye brands with yellow or green undertones. Not sure how figure out whether you’re warm or cooled toned? Check out our guidance tips below! If you are at all unsure about making a dramatic change to your hair, try one of our wash-in, wash-outdark blue hair dye products such as Splat hair chalk’s Midnight Blue or Manic Panic’s Dye Hard temporary hair color styling gel in Electric Sky. These amazing ultra-temporary dyes allow you to add a bright pop of color to any style, which conveniently washes right out in one go. They’re ideal if you want to see how you feel about a particular shade of blue, or if your school or employer wouldn’t be impressed with you sporting an unnatural shade. If you’re ready to take the plunge and dye a large section of your hair, one of our semi-permanent cream dyes should give you the powerful color effect you want! Herman’s Amazing Semi-Permanent Hair Color in Marge Blue makes an excellent choice for a bold blue hue; it is ammonia free and 100% vegan friendly! You would also look amazing in a darker shade like La Riche Directions midnight blue hair color, with its smoky purple undertones. These stunning resealable hair dyes last from 8 to 12 washes, making them a perfect choice for people who like to update their color regularly. If your natural or current hair color is quite dark, you will need to lighten your hair to achieve a bold dark blue hair color. In actual fact, lightening your hair with bleach is recommended unless you’ve got very pale blonde hair to start with. Semi-permanent dyes cover your existing hair color rather than altering it, so getting the shade you want will be easier on pre-lightened hair. This can be achieved quite effectively with home bleaching kits, particularly if you’re only aiming to lighten a small section of your hair for an Ombre or blue highlighted effect. One enormous advantage of using our semi-permanent dark blue hair dye brands as opposed to conventional permanent dye products is that they are kind to your hair! Many of the dyes in our range are free from harsh chemicals and actually work to sooth and condition your hair, leaving it soft and intensely shiny after each application. What a relief not to worry about damaging your hair when you want to top up your color! Whether you’re using a navy blue hair dye or a royal blue hair dye, your show stopping color can stay vibrant for weeks. For a deep and dark hair color finish that is sure to look sleek and sophisticated look no further than navy blue hair dye. If you have already tried a bright or neon shade then this dark hue is a great way to achieve a blue color with a subtle dash of navy tones.If you are looking for a dark and mysterious vibe then adding navy blue tone to your tresses will be perfect! All of our navy dark navy blue hair colors offer a bold and brilliant shade of dark blue as well as being packed full of neat features. Both La Riche Directions and Manic Panic dyes are Vegan-friendly, as well as being ammonia, PPD and paraben free. If you are tempted by midnight blue hair dye Manic Panic you can be sure it will have conditioning qualities. As well as having all these awesome features, this fantastic range of semi-permanent hair dyes is also available in multipacks! The La Riche Directions four packs mean you can rock the navy blue style for longer whilst saving yourself some cash through multi-buy savings! If you have a long mane of hair you will definitely need more than one tub to fully cover your hair. Navy blue is a hugely popular shade in the celebrity world with many famous names and stars proving that navy blue is a color to be reckoned with! It may not be as stand out and bright as some shades of aqua and turquoise hair dyes, but you can’t deny that dark blue dye produces some intense tones which are hard to get from any other color. Time and time again famous celebrities have opted for this dark blue look.Here are some of our favorite stars that have previously experimented with navy hair dye. The huge and high-quality range of hair dyes we have on offer makes the blue hair color a possible shade for you. Dark blue is a gorgeous color that you can incorporate into a whole variety of hair dye styles. Whether you want a full new head of dark blue hair or a blended blue effect, you can make navy blue dyes work for you! Why not experiment with some balayage, ombre or dip dye effects to really mix up you blue styles? It’s a color sought after by many, so what’s to stop you having a go? Navy blue hair can work for almost anyone, as the shade will cover most types of dark natural hair color. However, for the best results, it is often recommended that some shades of hair need to be pre-lightened before applying the dye. Intense natural hair colors such as fiery reds or dark browns should be slightly lightened before applying your new color. You can achieve dark blue hair dye without bleaching but the color won’t be as intense. Dreaming of achieving a new blue-tiful navy look and not sure how to get there? We’ve compiled a quick checklist for you, with some extra tips for anyone who needs to lighten their hair first! Prepare Your Hair – if you’re considering turning your hair a few shades lighter, you should first consider the health and condition of your hair. Bleaching can be damaging and may weaken the hair so make your hair is in the best condition possible. Hair care products and conditioners can ensure that your hair is in tip-top condition before undergoing a vigorous process such as bleaching. Pre-Lightening Is Key – in order for the dye to show up on some hair, it must be bleached to avoid clashing with any vibrant natural tones. You can easily lighten your own hair at home with simple bleach kits and lighteners. Getting your hair to a level 9 or 10 is sure to create a blank canvas on which the blue dye can comfortably color. If you are aiming for the midnight blue hair dye on black hair then you may be able to skip this stage. Try Out Some Toner – toners are an essential tool when getting the navy blue dye to work with dark hair. After bleaching, some unwanted tones and colors remain in the hair and could affect the completed finish of the navy blue look. Using a toner will neutralise these colors. Dye Away – Once the preparation stages are complete, it’s time to dye your hair blue! Make sure you have enough blue dye to cover the whole of your head, make sure you are happy with the color before you make your midnight blue hair dye permanent. Always perform a patch test before you get started. Once you’ve fully applied everything, it’s time to get out there and rock a whole new look! If you are ever stumped about how to dye your hair, we have plenty of guides and blog posts at the ready to answer all of your questions. If you’re not sure which shade of dark blue hair to try out, why not come and get some color inspiration from our social media channels? We’ve collated loads of awesome navy hair dye styles to get your creative minds ticking! If your motto is 'bolder is better', then you're sure to adore the Manic Panic Amplified Semi-Permanent Hair Dye in Atomic Turquoise! Have you got the hair colour blues? Turn your frown upside down with the intense and eye-catching Manic Panic Amplified Semi-Permanent Hair Dye in After Midnight! Step out in true style with the Manic Panic High Voltage Classic Cream Formula Color Hair Dye in After Midnight! Add a splash of vibrancy to your style with the Manic Panic High Voltage Classic Cream Formula Colour Hair Dye in Bad Boy Blue! 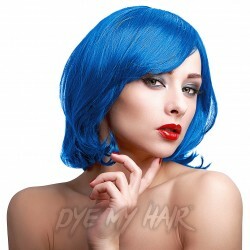 Strut your stuff with this bold shade of Crazy Color Semi-Permanent Hair Dye in Peacock Blue! Stand out from the crowd with this awesome blue shade.